I started to go on foot to the road. I was late that day so it was about mid day and Sun was fast. I was sweating and cursing the bike. I was already late and definitely will be more late because I have to go on foot to a long distance. When I am on bike I can take a shortcut but on that way Autos are not available. So I had to choose the long way. He took a U-turn and start pulling. When the point came from where I always took shortcut he didn’t moved he was going straight. “From near cemetery.” He told casually. I frightened. This is not that I was a coward. But the way near cemetery was isolated. So people don’t go there even in day light and there were some rumors about a ghost were popular. So my parents had strictly prohibited me to go that way. But today was different, I was late and with rickshaw puller I was also not alone. That way was really short. So I didn’t object much. Now we start talking. I asked him to tell some incident as the road was lonely, so I was not lucky to see some cute girls or anything romantic. He started to tell me a story, story about a murderer who was in our city. He killed many people near the same cemetery. That was the main reason people don’t go there alone. So the story was about a rickshaw puller. Who used to pull rickshaw in our city. He was a drug addict. So he never had much money to purchase drugs. That’s why his wife left him with their only child. He didn’t care about that. The whole day and night he was in influence of drugs. So the only source of money pulling rickshaw was also stopped. When he was not getting money, he started to pull rickshaw again but due to health and addiction he was not able to do full day. Money was short and his drug requirement was expensive. So he found a new way, he started to take his passenger by the cemetery way. While talking he told them to wait while he is going in cemetery to meet the keeper. After a long time he didn’t come. So the passenger would go in the cemetery in his search. At that time he came from backside and hit the passenger on head with a rod. He didn’t only robbed them to kill all proofs he killed all passengers. Police was shocked to get so many missing people complained. But they were not getting any clue. Because nobody can imagine that these murders were being held in broad day light by a rickshaw puller. Moreover no dead body was ever found, so police was clueless. One day the rickshaw puller got a passenger on the edge of cemetery. He was surprised to see a person near cemetery, he was afraid also whether this person doesn’t belong to police. But the person was a passenger, who lost his way and came here. He took the passenger. He didn’t know but it was like he knew that passenger, but where they met he didn’t remember. But he daily meets many people, perhaps it is one of them who took his rickshaw before. But this similarity was different. His face was sad. After reaching the road that person asked him that he forgot something in one shop so they need to go back. Rickshaw puller told he will charge money three times as he need to go and come back again. Passenger was ready. So they started back. When they reached cemetery, the passenger stopped the rickshaw puller and without another word went into the cemetery. Rickshaw puller waited a long and after half hour he went inside in search of passenger. 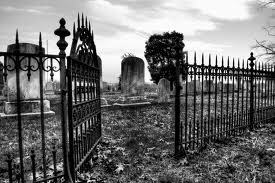 When he went inside the gate of cemetery closed itself. Rickshaw puller frightened. Immediately the passenger appeared in front of him. This time his face was not same, it had a cruel grin. His hand’s nails were like talons. Now he remembered that was one of his passengers whom were killed by him. Rickshaw puller stopped on this point. “What happened then?” I asked him with anxiety. We came to cemetery that was not far away from my college. The rickshaw puller stopped there and told me that he has some work with the keeper. I took this as a joke, I thought he is scaring me like his story. He went inside. I waited a long but he didn’t come back. Now I was worried. I went inside the cemetery but I was cautious about my back. I searched the whole cemetery, there was no body. I came outside again and there was no rickshaw. Now I was frightened. I ran to my college. I didn’t see that rickshaw puller again. I don’t know who was he? Whether he was the same rickshaw puller who was punished till eternity? But who the hell was he, I never used that cemetery way again. Very good Parshant. East to read and understanding. Gr8 to see your work. Proud of u dear.